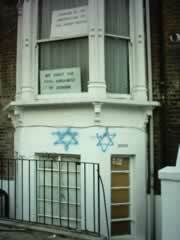 An Anti-Zionist Synagogue in North London was vandalized the evening of March 18, 2003 following an altercation with 100 zionists on Dunsmore Road earlier in the day during a planned burning of the Israeli flag in protest of the zionist state. 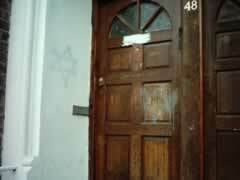 Zionists damaged the Synagogue door and desecrated the exterior of the building. 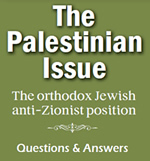 View pictures of the planned demonstration. The Hackney Gazette ran a short article on the planned Flag burning at Stamford Hill, London which was stopped by Zionists earlier in the day.